This is just a quick break. For the last couple of years, the Bowman Platinum brand has been a Walmart exclusive. My local Walmart store had three blasters on the shelf. By now they could be all gone. There are three different formats that you can find this product in – Fat Packs, Blasters, and Collector’s Boxes. Each comes with it’s own exclusive parallel. A Collector’s Box is the most expensive at $80, but that does include (2) autographs. The base set consists of (100) cards and the following parallels: Ice (Blaster), Sky Blue (Fat Pack), Purple #’ed/250, Blue #’ed/150, Green #’ed/99, Orange #’ed/25 (Collector’s Box), Red #’ed/10, and Foilfractor #’ed/1. Top Prospects have (100) cards too with the same parallels. Photo variations are quite easy to spot. The pictures are drastically different compared to a traditional base card. CMP codes for base are #264, whereas photo variations are #303. My favorite Walmart exclusive Topps product recently is 2017 Topps Gallery. But these look cool too. When talking about the base set, that pure blackness mixed with those psychedelic swirls is totally far out. 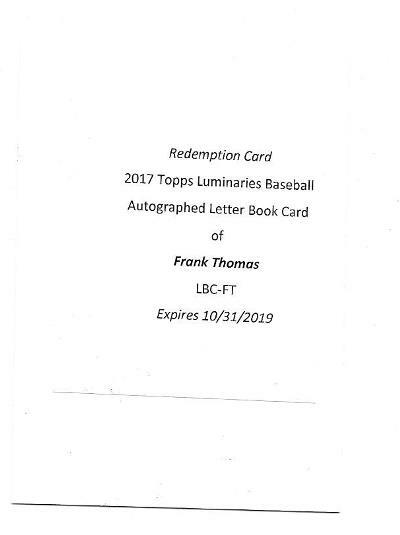 For Christmas I received a box of 2017 Topps Luminaries Baseball. This is one of my favorite high-end products that Topps released in 2017. Each box contains (1) encased autograph or autographed relic serial numbered to (15) copies or less. The checklist is filled with current stars, retired players, and Hall Of Famers. Its not priced for the casual collector or anyone on a tight budget, but its nowhere near the cost of something like Dynasty. In November I opened a box of this stuff and pulled a Frank Thomas Autographed Letter Book Card #’ed 1/1. This morning I was notified by Topps that it has been shipped. Rest assured, when it gets here I’ll definitely show it off. No booklet inside this box, but a decent player. The “189H” commemorates his season high 189 hits. If my memory serves me right, this is the first football product I’ve opened since Panini’s NFL exclusive went into play in April 2016. I’ve wanted to bust a box of football cards for awhile, but refuse to purchase anything from Panini. At one time I was a big Panini supporter. I can’t do that anymore. Not with the shenanigans they pull. Panini makes too many similar products, is lazy, and has a history of questionable slip-ups. No company is perfect, but there is just no excuse for some of the garbage they pull. Topps, Upper Deck, and Leaf should have an NFL license. All of that competition would create great looking cards. I settled on a box of 2017 Leaf Metal Draft Football. When Topps had an NFL license, a player’s Topps Chrome rookie cards were incredibly popular. Metal Draft Football reminds me a lot of Topps Chrome. The on-card chrome autographs make up for the fact they can’t use team names and/or logos. In many ways, Leaf’s unlicensed stuff is better looking than Panini’s licensed products.